There was a phone booth in the parking lot of the old Tropicana Motel on Santa Monica Blvd and this is where Tom Waits would conduct all of his business. 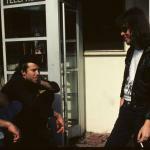 Here’s Tom Waits hanging out with Tommy Ramone of The Ramones in front of it. All the cool bands adored The Tropicana. 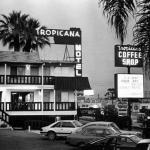 The Tropicana Motel in West Hollywood had a brush with celebrity even before it became a hangout for rock stars in the late ’60s and ’70s. 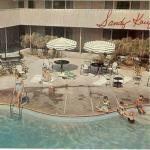 Baseball Hall of Famer Sandy Koufax bought the inn—which was built in the 1940s and located at 8585 Santa Monica Boulevard—in 1962. He was the motel’s fourth owner. 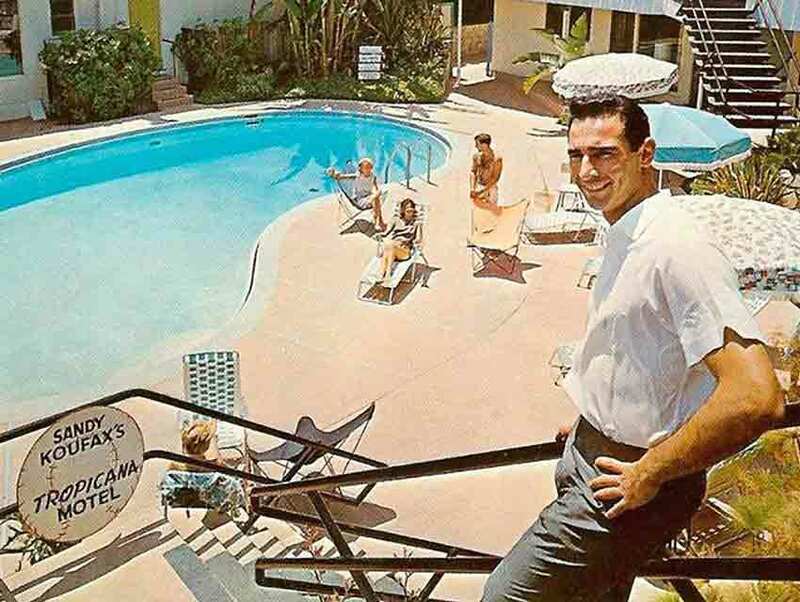 The Dodger’s investment no doubt drew clientele to the Tropicana, but the hotel became even more popular after Jerry Heiner and his partners purchased it from Koufax in the late 1960s. The joint was just a hop, skip, and blurry-eyed stumble from the Troubadour and Barney’s Beanery, and as the rock music scene grew up around those venues, the Tropicana became its unofficial HQ. 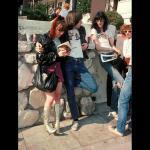 Janis Joplin, Bob Marley, Alice Cooper, Iggy Pop, and members of the Runaways, the Ramones, Blondie, the New York Dolls, and the Clash all passed through. 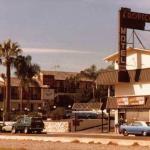 When Jim Morrison couldn’t book his usual room at the Alta Cienega Motel around the corner, he’d pass out at the Tropicana instead. According to the Los Angeles Times, Poet William S. Burroughs was occasionally spotted in a lounge chair by the pool, and Stevie Nicks and Lindsey Buckingham of Fleetwood Mac reportedly landed their recording contact while staying at the motel. Singer-songwriter Tom Waits became a permanent resident in the ’70s and moved his piano in without permission. Ricky Lee Jones is said to have written “Chuck E ‘s in Love” on that piano. 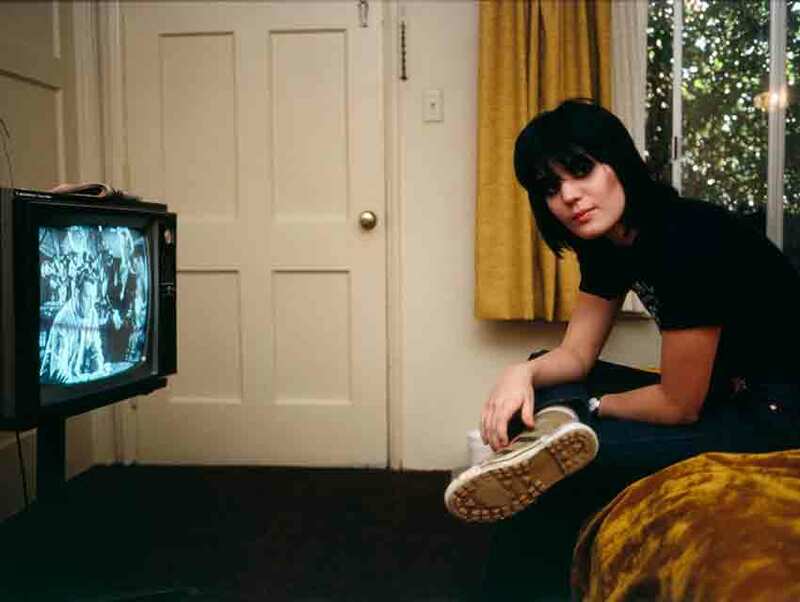 In addition to providing rockers room and board, the Tropicana appeared in the Andy Warhol film Heat. 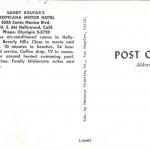 The motel was inexpensive despite its high profile. Guests staying a week were charged $29.75 a night. The wild days of the Tropicana came to an end in 1987 when the motel was demolished to make way for a $20 million dollar Ramada Inn and retail shops developed by Yehuda Naftali. Duke’s kept its rock and roll roots and moved next door to the Whisky A Go Go (and across the street from the Viper Room) on the Sunset Strip. 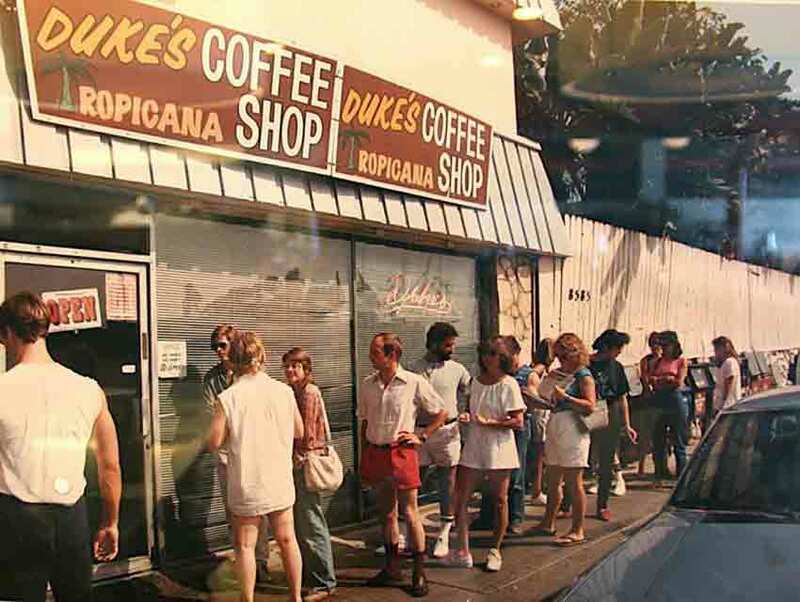 Gene Simmons, Eddie Van Halen, Elvis Costello, Quentin Tarantino, and Mickey Rourke were all regulars, but sadly Duke’s closed in 2012. The Ramada remains, but don’t expect to see so many ’70s stars hanging around the check-in counter. Did Los Angeles Witness America’s Last Iggy Pop Show?